One protein Mika is on quite frequently is beef. She's had beef shanks and ground beef. Lately, her beef has been the beef trim offered by Creston Valley Meats. Beef trim varies between different suppliers and butchers. I am very pleased with the beef trim I have received from Simon. Mika also adores the beef trim. Kyuubi will be getting some in the next few weeks. I will be adding bits of beef trim to his meals to get him used to a different protein. He's been eating chicken for the past few weeks and I think he's ready to add in another protein. The beef trim comes in boxes ranging from 10 - 20 lbs. The beef trim that I get from Simon is very lean, sometimes having tendons attached to it and has the silver skin covering of muscles. 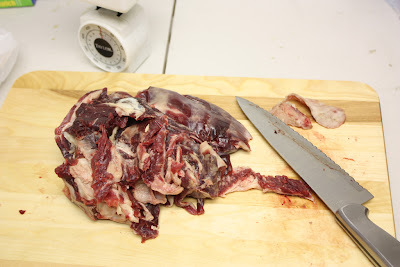 The beef trim is from spare parts after aging the beef for human consumption. The rest that are not approved for human consumption is put together for pets. Since the beef is aged, when thawed it doesn't give off much water content. What I love most about the beef trim is that it has already been cut up, which make it very easy to portion and pull apart when thawed. The only con I have experienced so far with the beef trim is that it does give off an odd odor, possibly because it was aged. 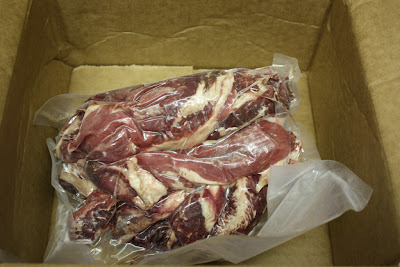 Overall, I am very happy with the beef trim from Simon and will continue to purchase it from him. It is probably one of my favorite products I have gotten from him.